One of my very earliest blog posts on Eco Child’s Play was the exciting discovery of a stainless steel sippy cup! Wow, that was over six years ago, and the [amazon_link id=”B0092ZVOPE” target=”_blank” ]Klean Kanteen stainless steel sippy cup[/amazon_link] is still my favorite! Now with a new lid and colorful bottles, these sippys can please both children and parents alike. We still use our stainless steel sippys from six years ago. 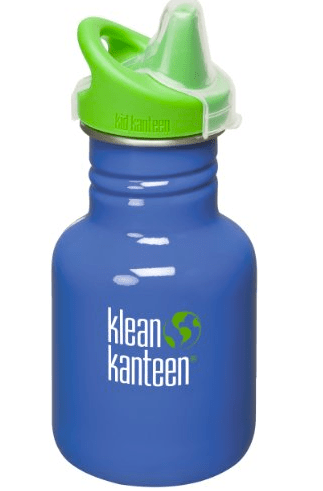 Even though my children no longer use a sippy lid, these bottles take a standard [amazon_link id=”B0083F0RKM” target=”_blank” ]Klean Kanteen lid[/amazon_link] of your choice to become water bottles. They are the perfect size to fit in my pocket when skiing. I trust Klean Kanteen. They have always been BPA-free (remember how Sigg lied to us), and they last forever! I have only had to replace two lids for the original bottles I bought when the company began. The bottles may be dented, but they continue not affect the taste of the water they contain! In 2004, Klean Kanteen® introduced the first hydration bottle made from stainless steel to give people a safe, healthy alternative to plastic. Our commitment to you and the planet drives everything we do. From our stainless steel creations to the company we keep, we are firmly fixed on the task of making healthy, high-quality goods that will faithfully replace a lifetime of single-use items. As exciting as the new stainless steel sippy cup lids are, I am even more excited about the new Klean Kanteen stainless steel food canisters. The next phase of our revolution is serious food transport for school, work, and play. 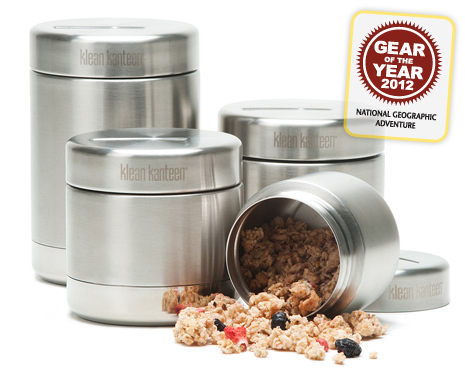 Bulk ready Klean Kanteen® Food Canisters replace a lifetime of throw-away plastic/paper containers and bags. Better still, our vacuum insulated canisters can keep things toasty warm or icy cold en route. Great for storing food at home or taking it with you to work or play, these food containers are handcrafted from the same durable, healthy materials you’ve come to expect from every product in the Klean Kanteen family. Canisters keep your food or dry goods fresh and tasty because they’re made from high-quality, 18/8 food-grade stainless steel that doesn’t absorb food flavors or odors. The wide opening allows easy scooping, pouring and cleaning. The lid creates 100% stainless steel interior and locks in flavor with an airtight seal. Our canisters are strong, durable, shatterproof, leak-proof, and beautiful as well. These stainless steel storage containers are so fresh, they aren’t available for sale yet but will be soon. I really love these canisters! They are the same super high quality you expect from Klean Kanteen, and the lids fit perfectly with a gasket to make them leak proof. Now I really want to try the [amazon_link id=”B006JWWWX6″ target=”_blank” ]Klean Kanteen Stainless Steel Pint Cup Pack[/amazon_link]! I do wish Klean Kanteens were manufactured in a country other than China, but it is a fact of our global economy and our desire for cheaper goods that forces companies to go oversees. As consumers, we are as much to blame. Nice review but I might suggest you consider Pura Kiki as the best sippy bottle… it is the only plastic free sippy on the market (the bottles shown above include a plastic sip spout). These bottles won a dozen or so awards in 2012 and we have been elated with them! Also, my wife and I love the Pura silicone sealing disks that allow a Kiki bottle to be reused as a snack/food canister. Instead of buying a whole new item, you can convert three baby or toddler bottles to snack vessels for a little more than $5… and of course the vessels will be 100% plastic free which I do not believe is the case with the ones above. Ironic, I just reviewed the Pura Kiki today!